In Roswell, New Mexico, exactly seven decades ago this month, the first little green men arrived. The metallic-looking, lightweight fabric was scattered, shredded across the gravel and sagebrush of the New Mexico desert. Brazel didn’t know what to do with the newfound items, or how they had landed on the property, so on July 4 he collected all of the mysterious wreckage he could find. On July 7, he drove it all to Roswell, delivering the goods to Sheriff George Wilcox. Seeking answers, he contacted Colonel “Butch” Blanchard, commander of the Roswell Army Airfield’s 509th Composite Group, located just outside of town. Blanchard was stymied. Working his way up the chain of command, he decided to contact his superior, General Roger W. Ramey, commander of the 8th Air Force in Fort Worth, Texas. “Apparently, it was better from the Air Force’s perspective that there was a crashed ‘alien’ spacecraft out there than to tell the truth,” says Roger Launius, the recently-retired curator of space history at the Smithsonian’s National Air and Space Museum in Washington, D.C. It was after the close of World War II, a time when nuclear weapons cast a long shadow. Truth-telling was not a priority, and there were remarkably unusual events underscoring the situation at hand. Everywhere you looked in 1947, the global, social and political chessboard was being re-divided. The Soviet Union began to claim eastern European nations for itself in a new post-war vacuum. Voice of America started broadcasting in Russian to the eastern bloc, peddling the principles of American democracy. The U.S. sent V2 rockets carrying payloads of corn seeds and fruit flies into outer space. The Bulletin of Atomic Scientists set the “Doomsday Clock” ticking, and the Marshall Plan was in the making to rebuild war-torn Europe. Small wonder that in the heat of summer that year, flying saucers became all the rage. Three days after the Dahl sighting, an amateur pilot named Kenneth Arnold said he had spotted a flying saucer in the sky by Mount Rainer, Washington. By the end of 1947, mass hysteria had seized the global mindset, with more than 300 alleged “flying saucer” sightings in the last six months of that year alone. “Not that there was ever any credible evidence to support the sightings,” Launius adds. By early July 1947, Brazel had heard tales of flying saucers in the Pacific Northwest. These sightings spurred him to show his discovery to the authorities, but just one day after the Air Force announced it had come into possession of a flying saucer, Roswell’s morning newspaper debunked the story. 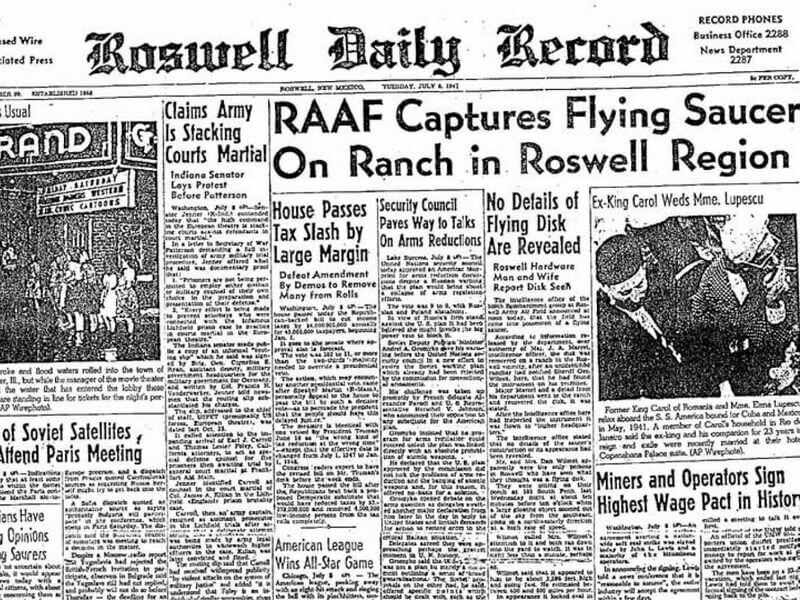 A published statement from the War Department in Washington claimed the debris collected on Brazel’s ranch was the remains of a weather balloon, and the Roswell Dispatch’s morning headline, “Army Debunks Roswell Flying Disc as World Simmers with Excitement,” set the tale to rest on July 9. And, Launius adds, thanks to the new, horrifyingly powerful weapon and a changing geopolitical landscape, it was a time of paranoia. Still, if the rumor of extraterrestrial visitors had been put to rest by the government, it didn’t die as easily in the public mind. Of course, though, that wasn’t the end. There would be a 1948 report from the government about what was now being called the “Roswell Incident.” In 1950, Frank Scully, a reporter for Variety, wrote Behind the Flying Saucers, a book that detailed alien encounters from the Pacific Northwest to the towns of Aztec and Farmington, New Mexico, where aliens were now said to be landing their aircrafts in people’s backyards. By then, enthusiasm for flying saucers had spread everywhere from Belgium to Russia and Japan. A rumor that had started as a convenient lie for the Air Force had become a distraction to the U.S. government, which was now deep into its nuclear weapons monitoring projects. “But there was no way the Air Force was going to admit what it was doing,” Launius says. Project Mogul was conducted out of Washington, D.C. and the Los Alamos National Laboratory in New Mexico, with some high-altitude balloon launches taking place in the high desert near the state’s border with Texas. Typically, a Project Mogul balloon sent into high altitude stretched 657 feet from tip to tail, 102 feet taller than the Washington Monument and twice as tall as the Statue of Liberty. As balloons rode on the upper jet stream toward Russia, a long tail equipped with different types of sensing and listening devices trailed behind. Although much of the documentation about Project Mogul has now been declassified, Launius says that civilian access to information failed to stop the lure of extraterrestrial life. Because the U.S. government was now in a frenzy of nuclear testing—both in the South Pacific and, later, at the Nevada Test Site—the hermetic silence around classified government programs left a certain segment of citizens suspicious. The UFO sightings continued. Movies such as Star Wars, Close Encounters of the Third Kind and ET, plus dozens of books on the subject, brought aliens to the forefront of the public mindset once again. Suddenly, there were rumors of regular extraterrestrial life on Earth, not to mention crashed spaceships. There were now stories of two alien ships crashing in New Mexico in June 1947, scattering their contents and tiny green crewmen across the landscape. Before long, any secret government property—from nuclear sites to engineering locations—was suspected to house deceased or imprisoned aliens. This was most evident at Area 51, an off-limits airstrip and aircraft engineering and development facility inside the Nevada Test Site, about 90 minutes north of Las Vegas. It was rumored that aliens from the Roswell spacecraft and other crashed ships were either being autopsied or slid into cylindrical glass tanks containing gel-like preservatives. And the alien hysteria had gotten even wackier. By the early 1990s, with scant evidence to support it, a global UFO and extraterrestrial industry had come into existence. There were more movies. More books. More newspaper and magazine stories, more television news segments and shows focused on visitors from space. In Roswell, the populace had been cashing in on the alien craze for some time. The town was home to the International UFO Museum and Research Center, and even a local Wal-Mart got into the spirit, decorating its walls and front windows with green-skinned, large-headed aliens. Roswell’s civic seal sports an artist rendering of an alien, and the exterior of the local McDonald’s in town has enough spacecraft-based accessories to look like a ship preparing to take off for some distant galaxy. Along the town’s Main Street, toy aliens, flying saucers and other extraterrestrial ephemera are sold in local shops. Roger Launius has served as the chief historian of NASA and sat on several investigative panels discussing what might exist beyond Earth, but he seems more amused by the 70 years of hysteria surrounding the “Roswell Incident” than anything else.